Boating in California is amazing. You can spend hot days and warm nights on the water with your friends and family. Fishing, water skiing, or even just cruising around is a great way to spend the warm months. However, many boat owners find themselves unsure about how to store their boat in the cooler months. Often owners in Redland, CA, have to decide between keeping their boat in the water, indoors, or outdoors. 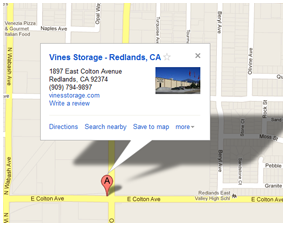 Vines Storage offers a variety of storage and rental agreement options. If you want to store your boat in the months that you won't be using it often, we can develop rental terms for those months. If you want your boat indoors and protected from wind, rain, and debris, we offer great units that are secure and have a consistent temperature. If you're planning to store your boat for several months, take these steps to ensure that it's ready for you when it's time to hit the water once again. Clean it. The work you do when you put the boat away will greatly decrease the work you have to do when it's time to take it out again. Wash it down, clean all the extra gear out of it, and treat the outside with wax. Be sure to let it dry completely before putting it into storage. Examine the boat. Take the time to look the boat over from bow to stern. The best time to fix small problems is while they're still small. If you see a bit of corrosion now and it goes undetected, it could be an eyesore when you take the boat out again in the spring. Take care of the mechanics. Give the inside of the boat a good look too. If you're not sure what you're looking for ask a professional for advice on how to best store the boat. They may advise that you fill the gas tank and top off the oil. They may also suggest flushing the cooling system. All of this work will ensure that when you're ready to enjoy your days on the water again, your boat is too. For more information about storing your boat, call Vines Storage today.